Eastern Ukraine has recently seen its worst period of attacks by Russian-backed separatists since they captured the town of Debaltseve in February. It had fallen in the days after the two sides reached the Minsk-2 ceasefire agreement. Ukraine, Russia and the West have repeatedly underlined the importance of Minsk 2, but whether it has been implemented remains questionable. The latest conflict has coincided with a period of Russian military escalation that recently prompted UK defence secretary Michael Fallon to suggest that Moscow was preparing for war with NATO and the West. The battle to control public opinion is taking place in parallel, as we have seen most recently with the case of Lyudmila Savchuk, a Russian journalist who went undercover in a Kremlin-backed agency whose staff were tasked with pushing pro-Putin views online. This has helped back up efforts by Russia in the traditional media to portray the heroic struggle of the self-proclaimed republics in Donetsk (DNR) and Luhansk (LNR) against the “Kiev Nazi Junta”, for example, while constantly denying any Russian military involvement. Someone can start bombing Kiev. We do not know who this would be but this can happen. A half of Kiev will be burned … Why do we have to wait? We have to start the offensive and to push them [the Ukrainian army] behind Kiev. We have to threaten Brussels, Warsaw and Vilnius and to make them dig trenches over there. Kremlin critics have been vocal too. The political writer Andrey Piontkovsky has said that the Putin regime would even go as far as nuclear war to stay in power, for instance. When it comes to Russian broadcast journalism, you see two different categories. 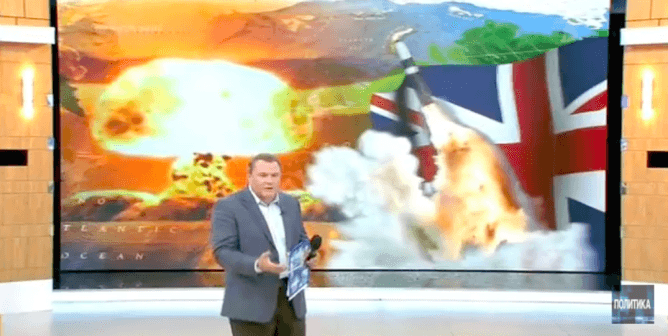 English-speaking channels such as Russia Today never go especially far, but the domestic channels routinely have debates about a full-scale war with the West. The self-explanatory screenshot below, from the Time Will Show news programme on state-owned Channel One in June, is a typical example. Which brings us to social media. As I have argued here before, chatrooms and Facebook pages played a pivotal role in sparking pro-Russian uprisings in eastern Ukraine more than a year ago. Pro-Russian online groups such as Anti-Maidan drew on neo-Soviet ideological clichés about World War II in their portrayals of Ukraine’s Euromaidan movement and the pro-European government led by Petro Poroshenko that came to power in 2014. The narrative remains that a “Kiev Nazi Junta” is at the forefront of a new offensive against Russia by an imagined fascist Europe. You see liberal use of Russian tanks and other WWII imagery, and calls for unity and readiness for “all Russian people” to repel these forces, garnering thousands of likes. The symbol below has been popular not only online but also on car windows in Russia. The words beneath the logo read, “1941-1945 we can repeat”. ‘Who do you think you are kidding, Mr Poroshenko? Anti-Maidan was publishing calls last summer for the Russian authorities to be more supportive towards separatists in eastern Ukraine and help it follow the path of Crimea and become integrated with Russia. Sites like this provided a forum for the discussions of conspiracy theorists after the downing of Malaysia Airlines flight MH17 near Donetsk last July. The majority of online contributors seemed quite confident that one of these theories about an inside job by pro-Western actors was true. But while you saw fresh rises in military enthusiasm on these sites at the time of pro-Russian advances in February and last August, generally the membership numbers have not been increasing and the number of comments has been falling. The fall in comments can be explained by tough administrators constantly banning commentators that are pro-Ukrainian or sceptical. At the same time, online journalists have been challenging past distortions. For example citizen investigative journalism site Bellingcat recently reproduced and studied social media reaction at the time of the MH17 attack to challenge the conspiracy theories. In a similar vein, Vice news correspondent Simon Ostrovsky has tracked the activities of a Russian soldier on social media to leave little doubt that regular Russian troops were involved in the February offensive on Debaltseve. The Lyudmila Savchuk story does highlight the efforts to which the Kremlin has gone to maintain bogus online sentiment using “troll farms”. Yet it doesn’t hide the sense of malaise on the pro-Russian side online – it is not difficult to spot the fake profiles. The suspicion is that ordinary Russians may be tiring of this conflict with the West. Reports of growing Russian casualties in Ukraine will not be helping – they gradually undermine the idea of a fast and victorious war. This doesn’t mean that the risks of the conflict escalating have passed, but it cannot be good news for Putin. It certainly suggests that the “we can repeat” mood cannot hold forever.